There are a number of possible reasons behind hair loss, whether it be an effect of cancer treatments, alopecia, menopause, stress, or another reason, the emotional implications are likely to be the same. For most women, hair is a hugely important part of their identity and femininity, and to lose it can cause a great knock to self-confidence. 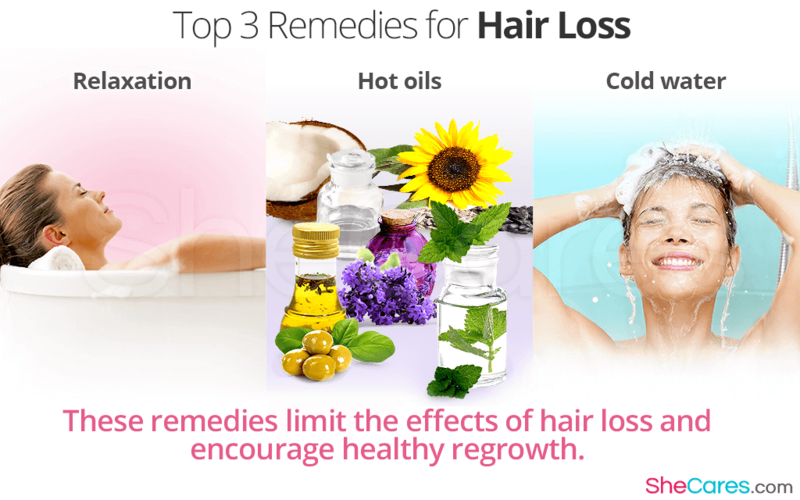 Information about the methods for how to limit the effects of hair loss, and encourage healthy regrowth, can be valuable and reassuring; find below a brief explanation about some of the most successful remedies. The heat, consistency of the oil, and action of massaging it into your scalp will hydrate your skin and can improve the health of your hair follicles, and therefore increase the likelihood of improved growth. One traditional remedy for stimulating hair growth, is to wash your hair in cold water. While a cold shower is unappealing to most women, many find that they benefit greatly from turning the hot water off at the end of the shower, and dousing their head under cold water for the last thirty seconds - or as long as they can bear it! This sudden shock of cool temperature on your scalp can stimulate hair growth, not to mention wake you up and rejuvenate you at the start of the day. One of the most common reasons for hair loss is stress. Whether this condition be a cause or effect of stress (I,e; one type of hair loss, known as trichotillomania entails pulling at your hair when you are experiencing psychological difficulties), it can be hugely helpful to alleviate anxiety and anger, thereby decreasing hair loss. Spending time with loved ones, or taking time for yourself, such as relaxing in a hot bath, can be effective for this. Hair loss can be a very difficult condition to come to terms and cope with. Hopefully; however, armed with some helpful information about what options are out there, it should be possible to find a treatment or managing technique for dealing with it. For more information about everything hair loss can entail, click here.